Make sure you enter on the individual Black Friday posts (not this post) to be entered to win. Do you have your Black Friday shopping lists made and ready to go? 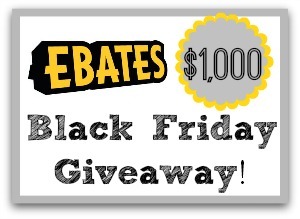 Don’t forget about the giveaway tomorrow where Ebates is giving away a total of $1,000! 1. Log in or register. 2. Choose the store where you want to do your online shopping from the list of over 1,500 participating stores. 3. You’ll be sent to the site that you clicked on, but Ebates will track your purchases the whole way. 4. Use any discounts that you have just as you would with any other transaction. 5. When you’ve earned $5 or more in your Ebates account, they’ll send you a check! Now, I bet you’re wondering about this $1,000 giveaway. It’s easy to enter. Southern Savers will be posting crazy deals available online all day Black Friday (I usually start posting around 5:30 am). Throughout the day leave comments on posts of what you grabbed (or wish you could grab) from the sale and you’ll be entered to win. I’ll be choosing one winner from 10 randomly selected Black Friday posts. Each winner will get $100 cash – that’s a total of $1,000. I’ll announce all of the winners on Monday 12/2. You can enter with comments on every post… so that means 10 chances to win at least. Heads up you can only win once though, we gotta spread the cash out a little.